Britain’s Lib Dems crash and burn. For Bismarck, politics was the art of the possible, while Napoleon would always ask of any general, “But is he lucky?” Put the two together and we can see politics as a game somewhere between chess and poker. Any politician has to gamble and take risks. He needs judgment, he needs nerve, but he also needs luck. 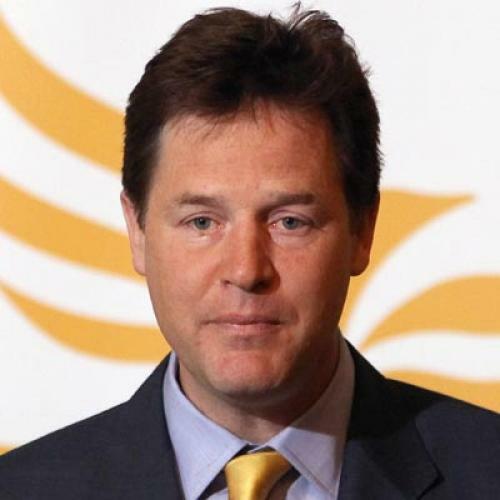 Over the first weekend of May last year, Nick Clegg showed considerable skill in playing a poor hand. The voters had just delivered a somewhat oracular verdict in the British general election. They’d had more than enough of Labour, whose share of the vote fell below 30 percent for only the second time since 1922, but they hadn’t quite taken to the Conservative leader, David Cameron, whose party gained 36 percent of the vote. That left Clegg. His Liberal Democrats had shot up in the polls for a few days of “Cleggstasy,” but, in the end, they only managed a disappointing 23 percent of the vote. Still, Clegg’s 57 members of parliament held the magic balance: Added to 307 Tories, they provided a healthy Commons majority. And so, after a tense weekend of wrangling, Britain got three things it hadn’t seen since 1945: a coalition government, an administration for which a majority of votes had been cast, and a party called “Liberal” holding office. For his pains, Clegg was much abused by the soft-progressive commentariat, who’ve for years purveyed an entirely unhistorical notion of a natural and permanent anti-conservative majority, and believed that the Lib Dems should never be allied with anyone except Labour. In obvious fact, the logical purpose of any third party must be its readiness to deal with either of the other two. There was nothing improper in Clegg’s handshake with Cameron. But it rested on a deal. While Cameron persuaded the Lib Dems to sign up to a range of policies which made them blench, beginning with a fierce program to reduce public spending, there were one or two sweeteners the other way. Or one in particular, which seemed to offer the Lib Dems—an amalgamation, some 20 years old, of the Liberal Party and the Social Democratic Party, which had bolted from Labour during its ultra-left phase in the early 1980s—their holy grail of electoral reform. In Great Britain, we have first-past-the-post, sometimes called the Westminster system, although it’s also of course Capitol Hill: legislators elected in separate districts on a simple plurality. More than two centuries ago, the French savant Condorcet explained why such a system must be unfair and inimical to a third party, let alone a fourth or fifth: It’s notionally possible for a third party to gain more than one-quarter of the national vote and yet not elect a single MP or congressman. Naturally, the Lib Dems yearned for a system that would reflect their vote in parliamentary seats. And so the Lib Dems were granted not a change of the system but a referendum on changing it. To spice things up, the Coalition agreed to differ on this referendum: Clegg and the Lib Dems campaigned for the change; Cameron and the Tories against (Labour was rather abjectly divided within its own ranks). There are arguments for and against almost any electoral system, and in one democratic country after another you will find people dissatisfied with the one they’ve got. (Only weeks ago Benjamin Netanyahu offered some advice for Cameron in a London paper: “Be careful of proportional representation. I give you that as a free tip.” He was only echoing what I had heard some years back from Shimon Peres, the once prime minister and future president, who fervently told me, “The electoral system is my country’s greatest misfortune.”) The system being proposed here in Britain was called alternative voting: Rather than only being allowed to vote for one candidate, people would rank their choices; if your first choice fared poorly, your other choices could count. A year after the election, on the first Thursday in May, the referendum was held—and for the Lib Dems it was a case of “The people have spoken, damn them.” The voters answered with a thunderous “no,” more than two to one against changing the system. Electoral reform is off the agenda for years, if not decades, and poor Clegg is well and truly fixed. He has nothing to show in return for supporting Cameron, certainly not the one crucial thing he had set his heart on. The Lib Dems can either remain tied in a coalition which makes them unhappier every day, or take their only other recourse, which is to withdraw. But that would precipitate a general election in which, as things stand, the Lib Dems would be slaughtered, as indeed they were in elections for the Scottish and Welsh assemblies and English municipalities held on the same day as the referendum. This whole affair has brought out the very worst in Clegg’s party. In his quaint and rather repellent memoir, A Journey, Tony Blair does have some good lines, and one of the most astute is about the Lib Dems, who always “were happier as critics than as actors.” They still are, as they’ve shown by whining and whimpering about the way the “no” campaign fought dirty, with a close colleague of Clegg’s saying forlornly, “Nick has been reminded that the Conservatives are a ruthless political operation that in the end serves the interests of the Conservative party.” Well I never. What makes it more ignominious is that the Lib Dems have long been notorious to both Labour and Tories “for fighting pretty dirty campaigns,” as Blair says, while they enjoyed themselves playing at irresponsible municipal politics. Now they’ve learned that it’s tough at the top. For Clegg, the outlook could grow bleaker still—and the history of smaller parties that join coalitions is far from encouraging. Where now are the Liberal Unionists of 1890 or the National Liberals of 1935? Swallowed up cannibalistically by the Tories. It’s at least possible that the same fate awaits the Lib Dems, or a chunk of the party, leaving the other rump to be ingested by Labour. For the moment, the question is whether the coalition will survive for another four years, or even one. And, after the remarkable success enjoyed by the Tories in these latest local elections given the economic circumstances, can anything stop them from winning a clear victory in the next election? David Cameron may or may not be a political giant in the making, but without doubt he’s a lucky general. Geoffrey Wheatcroft’s books include The Strange Death of Tory England, and Yo, Blair! This article originally ran in the June 9, 2011, issue of the magazine.